Every living thing is made up of cells. Every human begins life as a fertilized human embryo with one cell, and by adulthood has developed into five trillion cells, thanks to a process of cell division called mitosis. Mitosis occurs whenever new cells are needed. Without it, the cells in your body could not replicate, and life as you know it wouldn’t exist. Mitosis is a process of cell division, whereby a single cell divides into two genetically identical daughter cells. The five stage of mitosis are interphase, prophase, metaphase, anaphase and telophase. Mitosis starts with prophase, which occurs after an initial preparatory stage, which occurs during interphase – a "rest" phase between cell divisions. During early prophase, the cell begins breaking down some structures and creating others, preparing for the division of chromosomes. The duplicated chromosomes from interphase condense, meaning they become compacted and tightly wound. The nuclear envelope breaks down, and an apparatus known as a mitotic spindle forms on the edges of the dividing cell. The spindle is made up of strong proteins called microtubules, which are part of the cell's "skeleton" and drive the division of the cell through elongation. The spindle gradually lengthens during prophase. Its role is to organize the chromosomes and move them around during mitosis. Toward the end of the prophase stage, the nuclear envelope breaks down, and the microtubules reach from each cell pole to the cell's equator. Kinetochores, specialized regions in the centromeres of chromosomes – regions of DNA where the sister chromatids are most tightly connected – attach to a type of microtubule called kinetochore fibers. These fibers interact with the spindle polar fibers connecting the kinetochores to the polar fibers, which encourages the chromosomes to migrate toward the center of the cell. This part of the process is sometimes called prometaphase, because it occurs immediately before metaphase. At the very start of the metaphase stage, the pairs of condensed chromosomes line up along the equator of the elongated cell. Because they are condensed, they can move more easily without becoming tangled. Some biologists actually separate metaphase into two phases: prometaphase, and true metaphase. During prometaphase, the nuclear membrane disappears completely. Then, true metaphase begins. In animal cells, the two pairs of centrioles align at opposite poles of the cell, and polar fibers continue to extend from the poles to the center of the cell. Chromosomes move in a random way until they attach, from both sides of their centromeres to polar fibers. Chromosomes align at the metaphase plate at right angles to the spindle poles, and are held there by the equal forces of the polar fibers exerting pressure on the chromosomes' centromeres. (The metaphase plate is not a physical structure – this is simply a term for the plane where the chromosomes line up. Before moving on to the anaphase stage, the cell checks that all the chromosomes are at the metaphase plate with their kinetochores correctly attached to microtubules. This is known as the spindle checkpoint. This checkpoint ensures that the pairs of chromosomes, also called sister chromatids, split evenly between the two daughter cells in the anaphase stage. If a chromosome is not correctly aligned or attached, the cell will stop division until the problem is fixed. In rare cases, the cell does not stop division, and mistakes are made during mitosis. This can result in DNA changes, which can potentially lead to genetic disorders. During anaphase, the sister chromatids are drawn to opposite poles (ends) of the elongated cell. The protein "glue" that holds them together breaks down to let them move apart. This means duplicate copies of the cell's DNA end up on either side of the cell and are ready to divide completely. Each sister chromatid is now its own "full" chromosome. They are now called daughter chromosomes. At this stage the microtubules get shorter, which lets the process of cell separation begin. The daughter chromosomes travel through the spindle mechanism in order to reach the cell's opposite poles. As the chromosomes approach a pole, they migrate centromere first and the kinetochore fibers shorten. To prepare for telophase, the two cell poles move further apart. Upon completion of anaphase, each pole contains a complete collection of chromosomes. At this point, cytokinesis begins. This is the division of the original cell's cytoplasm, and it continues through the telophase stage. In the telophase stage, cell division is almost complete. The nuclear envelope, which had previously broken down to allow the microtubules to access and recruit the chromosomes to the equator of the dividing cell, reforms as two new nuclear envelopes around the separated sister chromatids. The polar fibers continue to lengthen, and nuclei start to form at opposite poles, creating nuclear envelopes from leftover parts of the parent cell's nuclear envelope, plus parts of the endomembrane system. The mitotic spindle is broken down into its building blocks, and two new nuclei form – one for each set of chromosomes. During this process, nuclear membrances and nucleoli reappear and chromatin fibers of chromosomes open out, returning to their previous string-like form. After telophase, mitosis is almost complete – the genetic contents of one cell have been divided equally into two cells. However, cell division is not complete until cytokinesis takes place. Cytokinesis is the division of the cell's cytoplasm, starting before anaphase ends and completing shortly after the telophase stage of mitosis. During cytokinesis in animal cells, a ring of proteins called actin and myosin (the same proteins found in muscle) pinch the elongated cell into two brand new cells. A band of filaments made of a protein called actin is responsible for the pinching, creating a crease called the cleavage furrow. 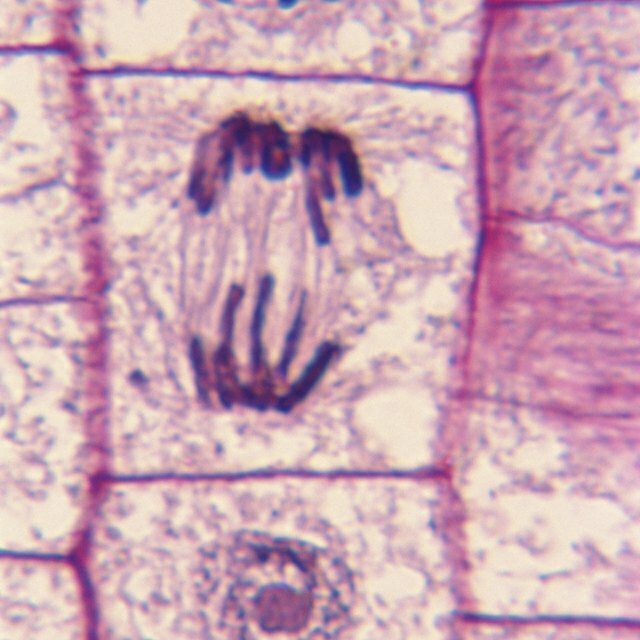 The process is different in plant cells because they have a cell wall and are too rigid to be divided in this way. In plant cells, a structure called the cell plate forms down the middle of the cell, splitting it into two daughter cells separated by a new wall. At this point, the cytoplasm, the fluid in which all cell components are bathed, is equally divided between the two new daughter cells. Each daughter cell is genetically identical, containing its own nucleus and a complete copy of the organism's DNA. The daughter cells now begin their own cellular process and may repeat the mitosis process themselves depending on what they become. Almost 80 percent of a cell's lifespan is spent in the interphase, which is the stage between mitotic cycles. During this stage, no division takes place, but the cell undergoes a period of growth and prepares itself for division. Cells contain many proteins and structures called organelles that must replicate in preparation for doubling. The DNA of the cell duplicates during this phase, creating two copies of each strand of DNA called a chromosome. A chromosome is a DNA molecule that carries all or part of the hereditary information of an organism. Interphase itself is split into different phases: G1 phase, S phase and G2 phase. G1 phase is the period prior to the synthesis of DNA, during which the cell increases in size. During the G1 phases, cells grow and monitor their environment to determine whether they should initiate another round of cell division. During the narrow S phase, DNA is synthesized. This is followed by the G2 phase, when the cell synthesizes proteins and continues to get bigger. During the G2 phase, cells check to make sure DNA replication has successfully completed, and make any necessary repairs. Not all scientists class interphase as a stage of mitosis because it is not an active stage. However, this preparatory stage is essential before any actual cell division takes place. Prokaryotic cells, such as bacteria, go through a type of cell division known as binary fission. This involves replication of the cell's chromosomes, segregation of the copied DNA and splitting of the parent cell's cytoplasm. Binary fission creates two new cells that are identical to the original cell. On the other hand, eukaryotic cells may divide via either mitosis or meiosis. Mitosis is more common process, because only sexually reproducing eukaryotic cells can go through meiosis. All eukaryotic cells, whatever their size or cell number, can go through mitosis. 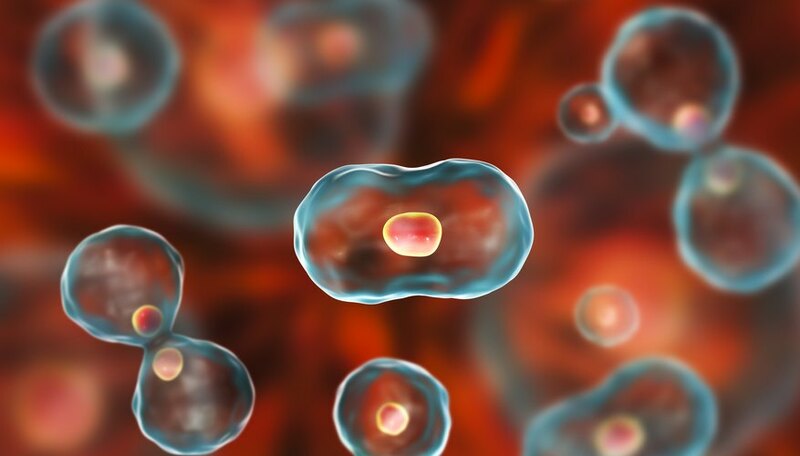 Cells of a living organism that are not reproductive cells are called somatic cells, and are important for the survival of eukaryotic organisms. It is vital that somatic parent and offspring (daughter) cells do not differ from one another. Cells divide during mitosis, producing diploid cells (cells that are identical to each other) and the parent cell. Human beings are diploid, meaning they have two copies of each chromosome. They inherit one copy of each chromosome from their mother, and one copy of each from their father. Mitosis is used for growth, repair and asexual reproduction. Meiosis is another type of cell division, but cells produced during meiosis are different from those produced during mitosis. Meosis is used to produce male and female gametes, cells with half the normal number of chromosomes, which are only used for sexual reproduction. A human body cell contains 46 chromosomes arranged in 23 pairs. The gametes are sperm or eggs, and only contain 23 chromosomes. This is why meiosis is sometimes called reduction division. All organisms must produce genetically identical daughter cells. Single-celled organisms do this to reproduce. Each of the produced cells is a separate organism. Multicellular organisms divide cells for three reasons: growth, repair and replacement. Multicellular organisms can grow in two ways – by increasing the size of their cells or increasing the number of cells. This last option is achieved through mitosis. Mitosis is a crucial part of the entire cell cycle because this is the point at which a cell passes its genetic information to its daughter cells. Division also makes sure that new cells are available as replacements when older cells within an organism die. When cells are damaged, they need to be repaired. They are replaced with identical cells capable of doing exactly the same job. All cells need to be replaced at some point in their lifetime. Red blood cells last for about three months and skin cells even less. Identical cells continue the job of the cells they replace. Mitosis produces two daughter cells with identical genetic material. They are also genetically identical to the parental cell. Mitosis has five different stages: interphase, prophase, metaphase, anaphase and telophase. The process of cell division is only complete after cytokinesis, which takes place during anaphase and telophase. Each stage of mitosis is necessary for cell replication and division. NIH Genetics Home Reference: How Do Cells Divide? University of California, San Francisco: What the Heck Does "Mitosis" Mean? Arizona State University: Where Do Cells Come From? Gillespie, Claire. "Stages of Mitosis: The 1st Phase of Cell Division." Sciencing, https://sciencing.com/5-stages-mitosis-13121.html. 17 April 2019.